From there, we were off. We spent the better part of the next hour partitioning the country into regions that made sense only to the person offering up the opinion. 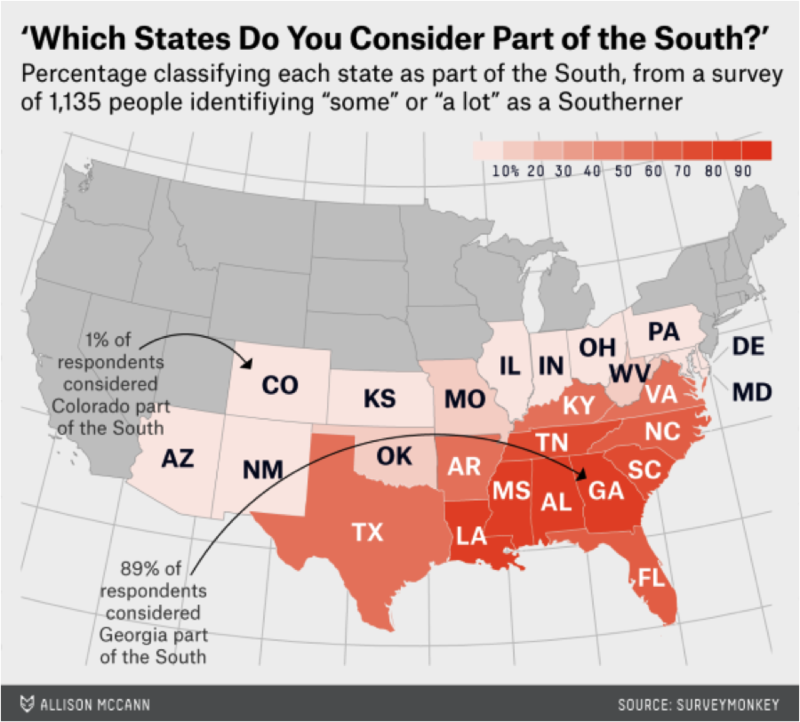 The key takeaway: people have opinions about how to define regions and virtually none of them are the same. 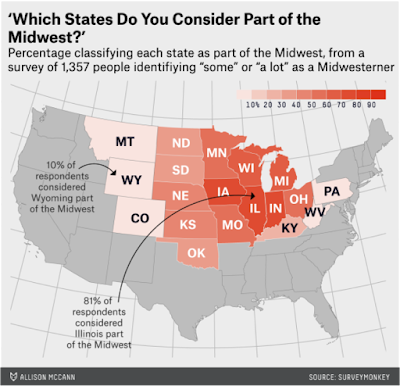 In summary, there is a bit less disagreement about the South than the Midwest, but both surveys produced some amusing (at least to me) results. 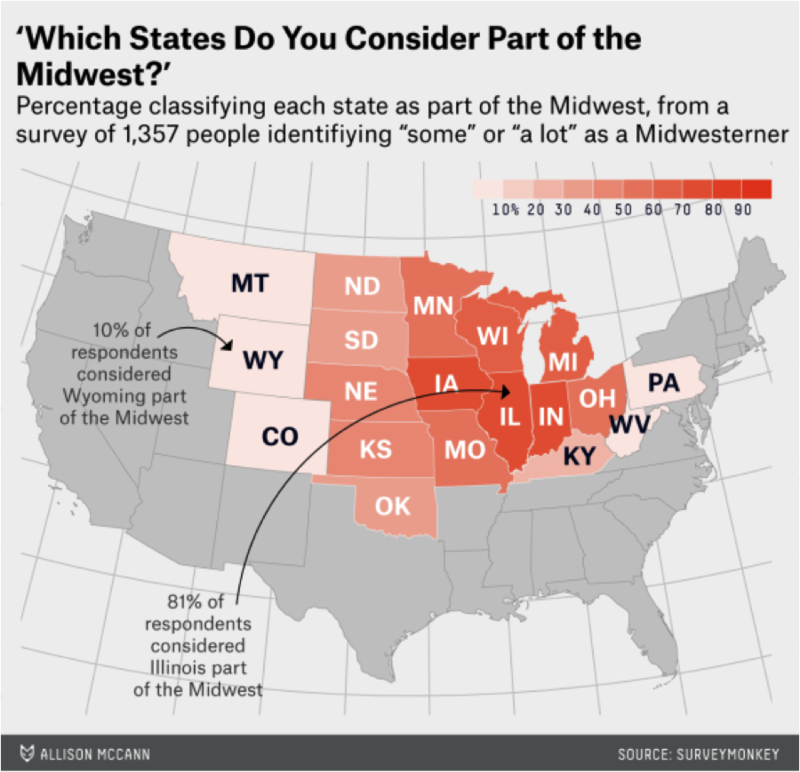 And interestingly enough, Missouri is apparently neither in the Midwest nor the South according to a majority of people who identify with those regions. MSAs or Metropolitan Statistical Areas are geographic designations used by federal agencies. The Office of Management and Budget (OMB) is responsible for delineating these regions based on guidelines that it applies to Census Bureau data. Officially, MSAs aren’t formal political designations and they are mostly used for statistical purposes. But they can and sometimes do have an impact on how residents and outsiders perceive regions. That’s a somewhat more rigorous approach than a survey, but the standards are, in the end, arbitrary. And as previously mentioned, this can lead to some less than satisfying outcomes. This is mostly unavoidable because reality is messy. Common identities are built upon various economic, political, cultural, and historical considerations that don’t lend themselves to a one-size-fits-all solution. And that’s OK! In fact, one of the things I have always found refreshing and exciting about Market Street is a research approach that allows for a great amount of flexibility in analyzing data and trends within “regions” – however we might want to define them. * Note that this was before the 2010-2014 NCAA conference realignments rendered farcical most references to regional coverage or membership totals in conference monikers. Never forget that for two years, the Big 12 had 10 members and the Big 10 had 12. Also, if I’m being completely honest, my own conceptualization of United States regions is influenced to an alarming degree by college football conferences as they existed at some point around 1994. Is the American Dream Just a Pipe Dream?